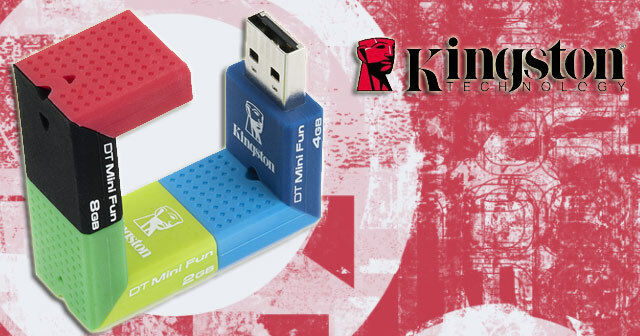 Posted on December 15, 2010 by Jill B.
Kingston Technology brings a new meaning to USB connectivity by adding a little color and novelty to a product that ultimately reigns in functionality: the Kingston DataTraveler Mini Fun G2 USB flash drive. Think of this memory stick as a rubberized hybrid of a unifix cube and a Lego. If you have the digital storage needs that demand more than one of these flash drives, you can link all of them together in a design of your choice. This concept helps to customize what could be considered by itself a standard device. Other manufacturers may brag about their flash drives’ large capacities, but if you are storing multiple files rather than a few giant ones, the mini DataTraveler is a unique alternative. The Mini Fun snap-together drives allow you to have as much or as little storage as you want. In this way, Kingston makes it easy to keep track of multiple thumb drives—you never have to worry about losing one since they can be attached. Kingston’s Mini Fun flash drives come in a few different bright colors, which also serve to identify their storage capacity. The 2GB drives come in both lime and forest green while the 4GB flash drives come in turquoise and dark blue. The 8GB USBs are available in black and red. Hopefully, they can eventually expand on that color palette for added customization. While these colors are fun, their appearance will likely serve a more significant purpose. Since these are tiny USB flash drives, they are always more difficult to find whether it be a desk drawer or the bottom of a backpack. As a result, the brightly colored Mini Fun drives (minus the black one) will make the searching process relatively painless. These mix and match USB flash drives are friendly with multiple operating systems—Windows, Mac and Linux. Pricing will range from approximately $7 to $14 apiece. No word yet on when they’ll be available for purchase from online resellers, but check back on Kingston’s site to stay posted. What do you think of the buildable flash drive concept? Feel free to comment below! This entry was posted in Articles, Cool Drives, Flash Drive, Kingston DataTraveler, Kingston Technology, USB Flash Drives, USB Storage Drives, USB Technology and tagged 2GB USB drives, 4GB flash drives, 8GB USB Drives, Colorful USB Drives, Kingston DataTraveler, Kingston DataTraveler Mini Fun G2 USB Flash Drive, Kingston Mini Fun flash drives, Kingston Technology, Kingston USB Flash Drive, mini DataTraveler, Mini Fun G2 USB, Mini Fun G2 USB flash drive. Bookmark the permalink.